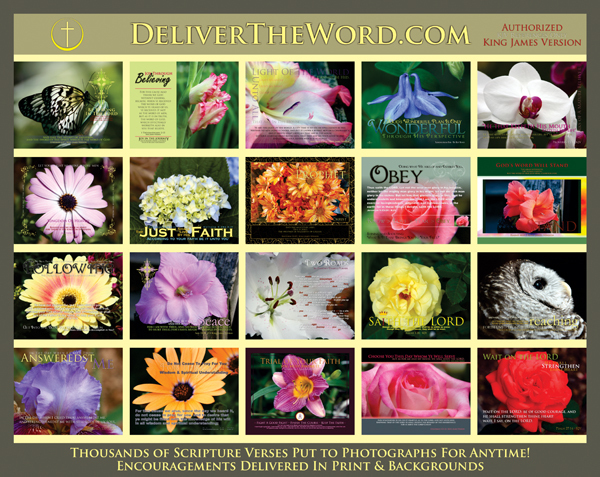 It is not complicated really… The purpose of this site is to make available to others the many prints, designs and materials that we use to Encourage those we are in fellowship and contact with. Not sure we could count all of the ways God has allowed us to spread the Good News and share with others how GOOD God has been to us, but this is a start – and the items you find here have ALL BEEN TESTED before you get to see them. We’ve had the opportunity to see the power of the Scriptures to sooth hurts, disappointments, losses and pick up others through our personal “Ministry of Encouragement“. Once you see them, you may then come to understand that our family has had a few bumps, bruises and scrapes along the pathway of life – but what we desire of you to see is the Love of God, His boundless Mercy and a Goodness that has no equal outside the Saving Grace of Salvation through Jesus Christ His Son. We’ve come to understand those jostling items along the path have purpose in our lives, which have allowed us to impact others in at least some small way in a few others. This site allows a few talents, skills, abilities – whatever one may want to call them – to be used for the benefit of the pointing others to the King of Kings, Lord of Lords – by showcasing HIS Word super imposed upon a matter of interest – some things of beauty. Our Hope is the utilization of the Eternal Hope making the profound impact upon each of our lives such that we see to build up others in the Lord. That will only come about as we spend more time with surrounding ourselves with God’s Word… The expected difference being made is and will only be made by being “around” the influence we want to emulate and/or imitate. The more time we make available for the things of God, the more that Hope will become evident to those around you – your speech changes, your actions change, your demeanor changes, your perspective changes – the list goes on and on, because YOU are changed. Our HOPE is one we can point you toward, but we cannot make you partake – this site is a multi-pronged guide to do so though… You’ll soon see, our HOPE is the HOPE of the world – we are and want to point you to the Cross of Calvary, where everyone will plainly see the Savior! There are SO MANY exciting things to find on this site – where would one start??? Positively every item that you will run across has a message to it, which has been met with study, pondering, reflection AND utilization… How’s that you may ask? Simple – everything here has been developed off of impact – nothing has been copied and pasted, then having the “publish” button pressed. This one has to have folks scratching their heads – because there is a LOT of stuff here. But, you will not find items that tear down – before you go WHOA wait a second – let me explain. If you are around “negative” things, you will tend to be negative after so much of the influence creeps into you by your willingness to STAY there. Folks may say… “then you are not using the whole counsel of God if you don’t…” – they’d be incorrect. Should you look long enough, you are going to find something that may not “stroke” you the right way or manner – actually there are number of them… God’s Word is about instruction, conforming to the image of Christ, putting our Trust in the Savior and Walking in God’s Will for our lives. All of God’s Word is given so that we LOOK to Him. For those that will throw New Testament only my direction, might want to take a read in Job 37 – the passage will sit down even the most ardent of folks about what they think is negative. Will we “…consider the wondrous works of God” as we ponder negativity shown to us in verse 14? The ribbon of correction is FAR from negative, it is presented to us as a matter which is of utmost importance to a thrice HOLY GOD who’s Son is the Ultimate Encourager! We’ve been charged, just as Joshua was charged in Deuteronomy 3:28 | KJV, and we are to encourage, just as Joshua was encouraged, as well as we are to strengthen, just as Joshua was strengthened for each of us are to go before the people we are around to cause them to see what land they can inherit because of the Encourager in each one of us! Depends. Which “stuff” would you be asking about? We as a family make ourselves available, taking the time it takes to listen to the prodding of the Holy Spirit to maintain our “Ministry of Encouragement” status. Most of the items that you see – I design. Poems and special tributes are generally Courtney’s. Photography for the most part are both Melissa’s and mine, with an occasional viewpoint provided by Courtney. The hymns, Scripture digging and series development are generally mine. REMEMBER – each series has an intended recipient for which it was originally designed. YES, we know a lot of people – it is the benefit of being involved with a multi-cultural, multi-faceted ministry, whose focus also includes Mission Points around the world. We indeed are SO blessed to have such a special group of people in which to be an Encouragement and minister along side with, not only here in Fuquay-Varina (Greater Raleigh Area), North Carolina – but in Seffner, Florida and all over the United States – Venezuela, India, Philippines, Honduras, Brazil, China, Brazil, Russia, Moldova, Israel, United Kingdom, Australia, Chile, Mexico, Canada, Spain, Greece, Japan… The list goes on and on and on – for the Cause of Christ, We Encourage! May We Encourage Everyone We Meet & Have Hymns and Songs Pouring From Our Lips!